Depending on what lectionary readings you choose today (there are several options: Matthew 2:13-15, 19-23 in which the Holy Family flees to Egypt; Luke 2:41-52 of the boy Jesus in the Temple; Matthew 2:1-12 of the visit of the Magi; or the Gospel from last Sunday, John 1:1-18), this Sunday’s focus can be radically different. What they all have in common is that God is now with us, in human form, in Jesus. Whether as an infant, small child, or boy, he faces the same conditions all humans face in the world today – as a refugee, beloved child, or inquisitive youth. With that come choices, temptations and those who would seek to have us live a different life than the one God calls us to. The Word that has always been and always will be is in our midst. The stories of the Christmas season continue this week, and should be shared with all ages. Our other readings today focus on our being a child of God. Through the birth (and death and resurrection) of Christ, God’s power over nature and in history has restored our human nature. God has given us all spiritual blessings in Christ and adopted us as children. The adoption language that comes from today’s reading from Ephesians is associated with our baptismal liturgy: All praise and thanks to you, most merciful Father, for adopting us as your own children, for incorporating us into your holy Church. (BCP 311). Paul does not ask that God should act by a power, as it is often expressed, which works for us, but by a power that works in us. God is able to do above all that we can ask or think according to His power that works in us. What a place is this which is given us in Christ! God dwells in the assembly by the Spirit, and Christians, whether Jews or Gentiles, are united in one. He desires that the Ephesian Christians (and all of us) should walk worthy of this vocation. Their vocation was to be one, the body of Christ; but this body in fact is manifested on earth in its true unity by the presence of the Holy Spirit. May God the Father, who by Baptism adopts us as his children, grant us grace. Amen. May God the Son, who sanctified a home at Nazareth, fill us with love. Amen. 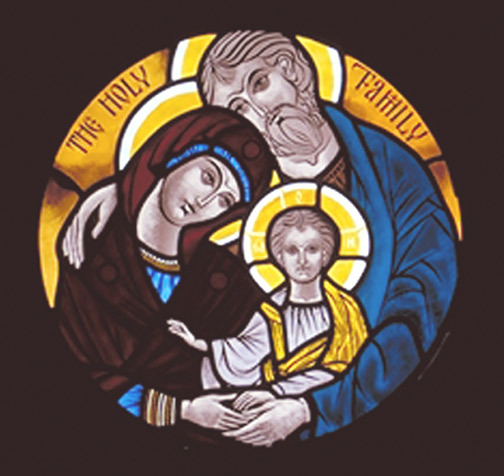 May God the Holy Spirit, who has made the Church, one family, keep us in peace. Amen. This entry was posted in Christmas, Epiphany and tagged Baptismal Covenant, Book of Common Prayer, Christmas, Ephesians, Faith, God, Holy Family, Jesus, John 1:1, Lectionary, Nativity of Jesus. Bookmark the permalink.